Find out more about IEEE 1584-2018, how it will effect you and how our software addresses those changes. Configure EasyPower for the specific tasks you perform most, then add features as needed. It’s completely customizable and scalable. Simply choose one of our most popular suites, or build your own. 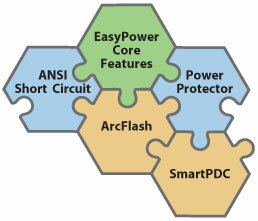 One-touch automation for detailed short-circuit analysis and PDC to enhance design and power system studies. Everything you need to create and implement a comprehensive and fully compliant arc flash safety program. Perfect for design and consulting engineers; features one-touch automation that completely revolutionizes the entire design process. 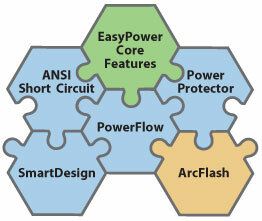 No matter which configuration of EasyPower power system software you choose, the productivity-accelerating features below are included at no additional charge. It is completely customizable and scalable. Simply choose one of our most popular configurations, or build your own. 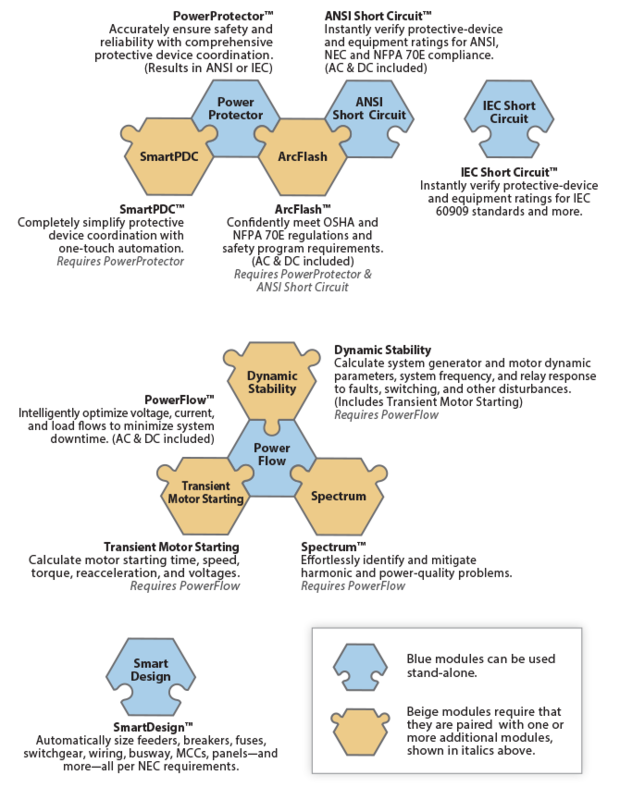 Some modules can be used stand-alone (blue below), while others require that they are paired with one or more additional modules (beige below). EasyPower’s native language support is English. The software is also available in Spanish and Chinese, although updates to these languages may not be available until after the English version is released. The software menus, dialog boxes, documentation and online help are supported in these languages. You can find instructions for installing additional languages here: Language installation instructions. The software also has online support documents available in Portuguese. Download a free demo copy today. You can also contact us if you have questions or would like to schedule a one-on-one session with an application engineer, to help you get started with your EasyPower demo.